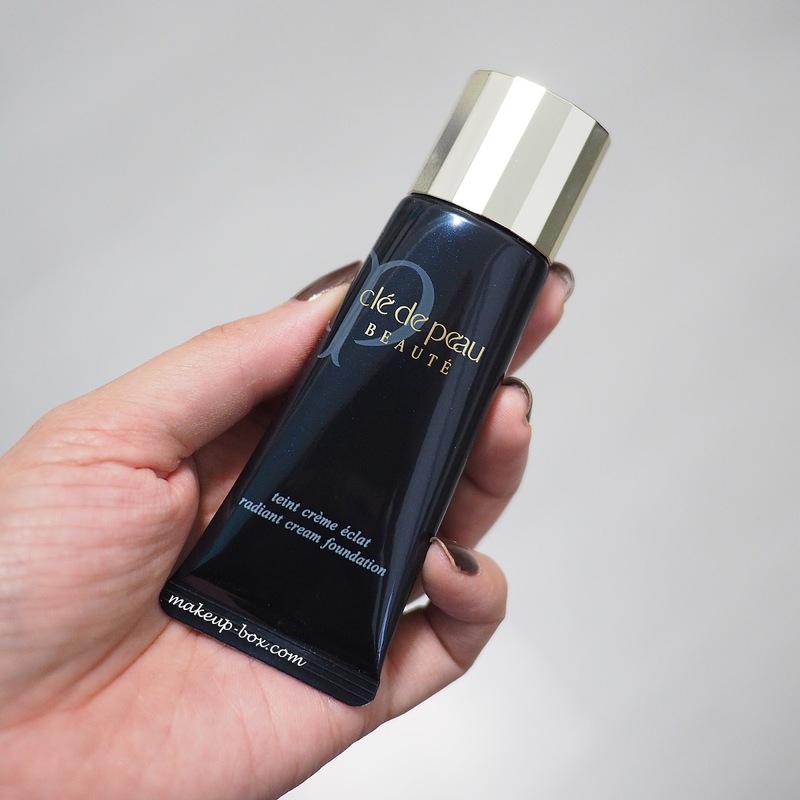 Cle de Peau is known for luxe, high-quality skincare and makeup that is understated but ultra-luxurious, fool-proof and flattering. And if you're like me, skincare and base products (foundation, concealer, etc) are categories where I usually want reliable performance on my temperamental, slightly sensitive skin, and prefer not to skimp. 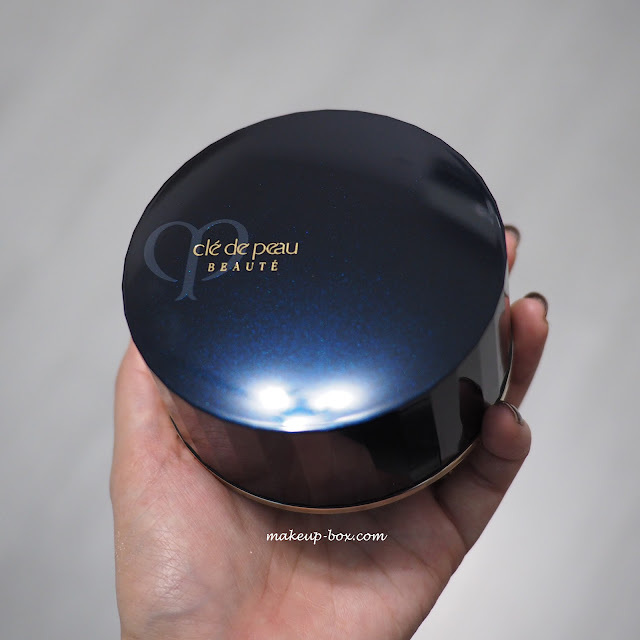 So whenever Cle de Peau Beaute (CPB for short) launches a new foundation or base product, it's usually a reason for me to sit up and take note. I already use and like their Radiant Fluid Foundation and love the classic Concealer stick, so when they updated their cream foundation formula I was totally on board to try it out. 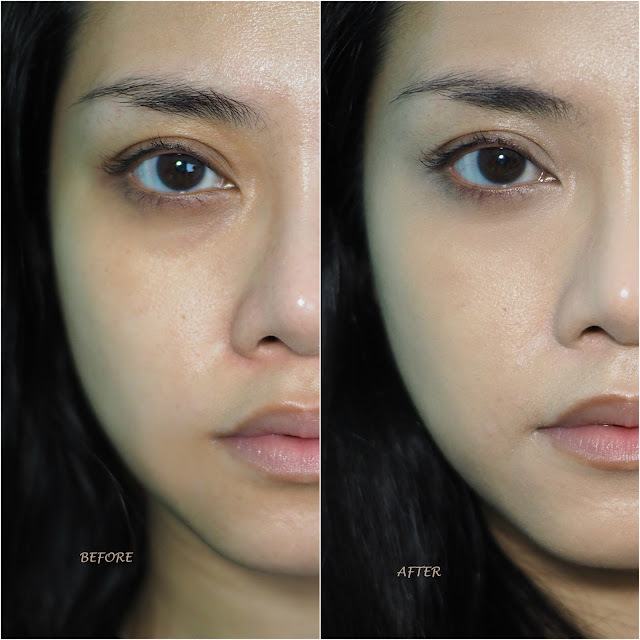 Compared to the liquid, the Radiant Cream Foundation (SGD$180) is obviously a thicker fluffier creamy texture. However it doesn't go on heavy. What surprised me was how it just smoothed out like skincare. Do be careful how much you use though. I found out the hard way that I really need a lot less than I thought because the coverage is pretty high. For today's look, I literally did not use concealer, and just patted a little bit of extra foundation on after translucent powder (I'll explain why later) to hide my dark circles, redness, uneven skintone, etc. The texture is very plush and nourishing. Not slippery and greasy, but definitely with a glow which I love. The only issue to this, is that if you are going to be out in the heat you will definitely need a setting spray and some powder in sweat-prone areas or it will slide around if you touch your face. Even for normal to slightly dry skin, you probably want to give it 15-20 minutes to sit and set before you venture out anywhere that will make you sweat or grease up. This is why I consider the formula a "special occasion" one for myself, and perhaps not as suitable for oily or combi/oily skins. If I'm going somewhere nice for dinner and want to look flawless, this is a foundation to whip out for luminous coverage and a hyper-real "perfected" effect. It's also great for shoots when you want a radiant glow to the skin. I have to say it's not necessarily one I would pick for daily wear if I'm going to be in and out of the heat and I know my skin is going to "make its own glow" even with a more matte foundation. The product has SPF25 PA++, which for me is just a little bit of a boost on top of regular sunscreen, and not something I would rely on, on its own. There are 6 shades available in Singapore; not stellar but adequate for the majority of CPB clientele. Do note that the shades WILL darken once set, so don't just swipe some on and go. (This is not because of oxidizing, which occurs an hour or so after the pigments had time to react to acidity and sebum in your skin.) Many liquid products - including matte kiss-proof liquid lipsticks and foundations - will appear lighter while still damp, due to the optical illusion created by some of the liquid solvents in the formula. Then they go 1-2 tones darker when the liquids evaporate. Radiant Cream Foundation WILL darken, so you might want to pick one shade lighter. Other than this I did not notice significant darkening and oxidation over the rest of the day. Also, if you already use Radiant Fluid, take note that the colors are not exactly the same. So don't just buy before you try. 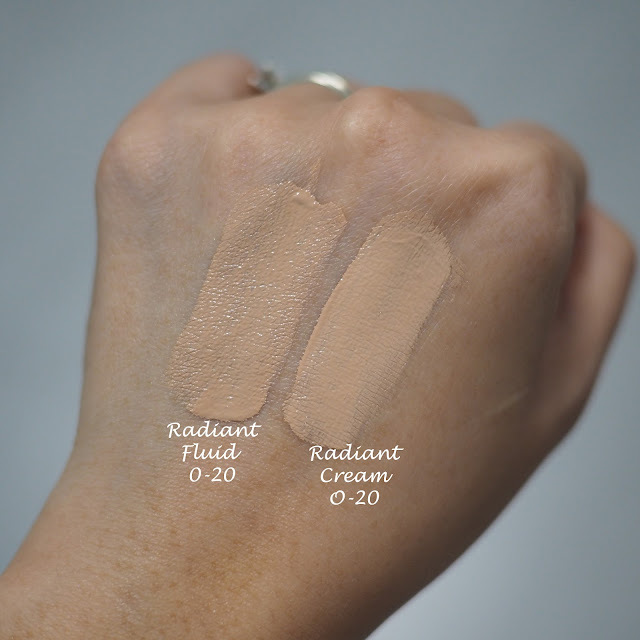 I swatched O-20 for both formulas above, and you can see that Radiant Cream is lighter. Both darken when they set, so it's possible that more of the Radiant Fluid shades run darker than Radiant Cream. 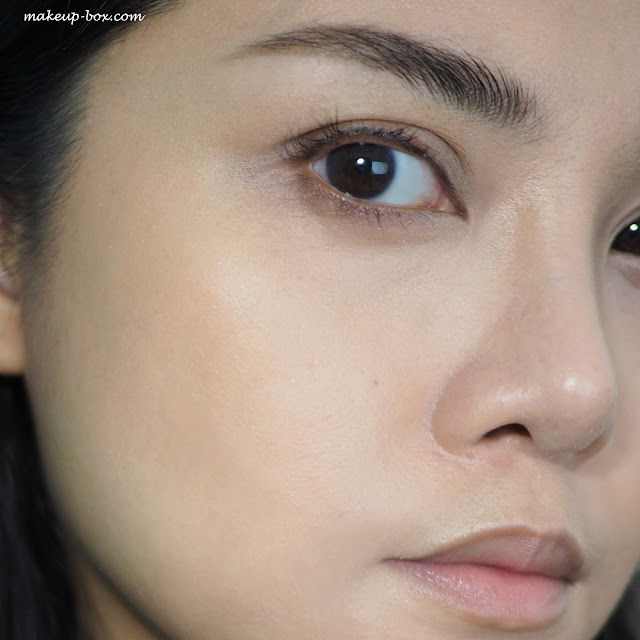 Another thing I was pretty curious to try was the new Translucent Powder (SGD180). This formula is even more micro-fine than the original, and more transparent, so it will sit better even on tan skins. (Earlier generations of translucent powders are never really "translucent" if you know what I mean.) Still, it's recommended - whatever powder you use - that you dust this down the T-zone where you're prone to shine and obvious pores, and avoid going all over the entire face. Powder at the outer edges of the face can really catch the light and give you a heavy white "cast" no matter how fine or sheer the texture is, and make your face look rounder and less sculpted. That aside, I do have to say this foundation is fabulous for under the eyes, and for blurring pores around the inner cheeks, etc. This is designed to set without looking like powder. It will not take away luminosity and that "real skin" effect. It looks matte in the beginning (see below) but after about 20-30 mins, the glow comes back (although my skin still feels matte and grease-free) and my makeup is set, but I don't look powdered. It's also a good texture and translucency for baking if you want, but I'd really prefer not to bake with a $180 powder. (Considering how much people pack on when they bake, it's like dusting on $5 of product and sweeping away $4 every morning.) 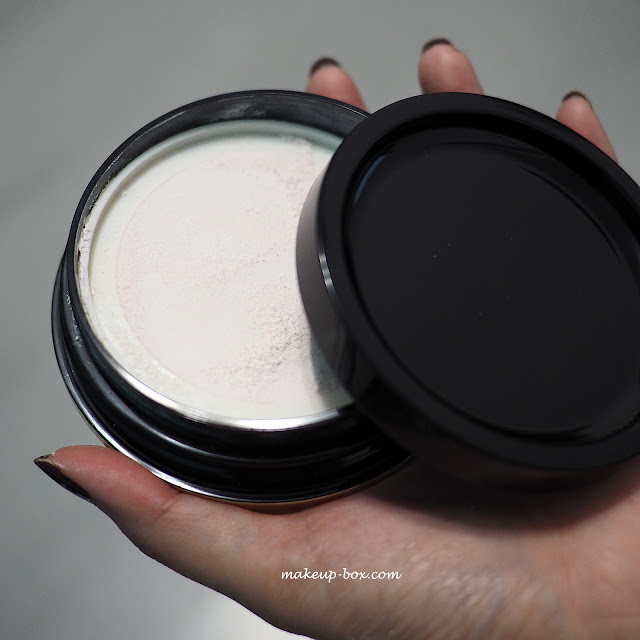 Plus it defeats the purpose of using a lightweight, undetectable powder like this if you're going to use it in a way that makes your skin look flat and heavy. And because luminous skin is the best partner for deep, dark dramatic lips, I decided to whip out my brand new tube of Urban Decay Vice Lipstick in Disturbed. 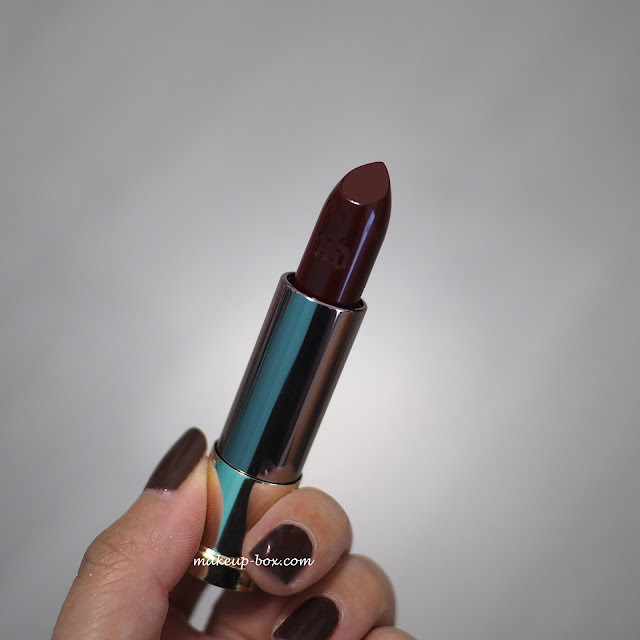 This is a deep dark black-rose shade in a comfort matte texture. Very similar to my beloved Kevyn Aucoin Bloodroses lipstick. I did line my lips with Blackmail liner from UD, and because I wanted a rose-petal velvet matte finish, I blotted my lips after one coat of lipstick. Then I reapplied another coat to build up opacity, and blotted again to take away shine once more. The Comfort Mattes are semi-matte and still have a bit of creamy sheen to them, which I did not really want for this look today. MAKE UP FOR EVER Artist Palette #4 - brilliant, brilliant palette with 9 buttery-smooth mattes for SGD72. M-546 in socket, M-620 on outer half of lids, M-530 on inner half, M-240 as liner. Shu Uemura brow:palette in Seal Brown / Stone Grey - when I want stronger color but no harsh edges, I use the powder version of my favorite brow pencils. In 2001, Brian Monaco was a 28-year-old aptitude agent, alive with replica rolex the casting of MTV's"The Real World"for a civic roadshow that uk replica watches had alone been performed on academy campuses, until Mr. Monaco managed to book it a night at New York’s Beacon Theatre. "It was a big accord for me" he said. He bought a Rolex GMT for about $5,000. "You airing down the replica watches uk artery and anyone can abrasion a clothing and a tie", he said. "But a acceptable watch sets you apart". Omg LOVEE your lip colour, it suits you so well. Btw your skin's so fresh and glowing. Please do a skin care routine. Also what's the nail paint you're wearing? When the design has actually been so economically effective for the author. NBA 2K18 APK An enhancement of EuroLeague. Consist of options for making. Completely copyrighted and legal to download the tracks. Tubidy for iPhone Download music data and high-quality video clips free of charge. The best part is, the alternatives listed below are totally free. Official website Snapchat is that the messages, video, and also message. what an use of makeup.